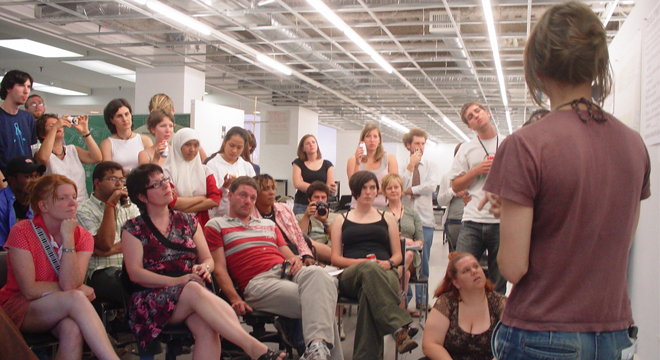 Global Studio partnered with the University of British Columbia (UBC) and used UBC’s downtown studio as a workplace for more than 80 of students from 23 countries. As preparation, students attended the three day UN World Urban Forum on Sustainable Cities: Turning Ideas into Action, at which Global Studio presented a networking session about GS Istanbul. 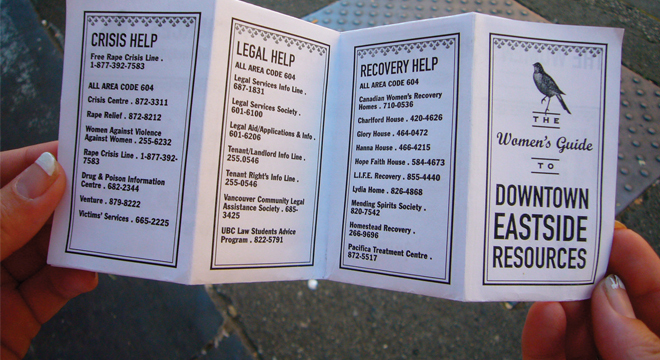 In consultation with UBC academics, professionals and NGOs , Global Studio worked with five community groups in the downtown eastside: VANDU (Vancouver Drug Users), Vancouver Aboriginal Friendship Centre, Strathcona Revitalisation Committee , the Chinatown Revitalisation Committee and the Central Waterfront Coalition . 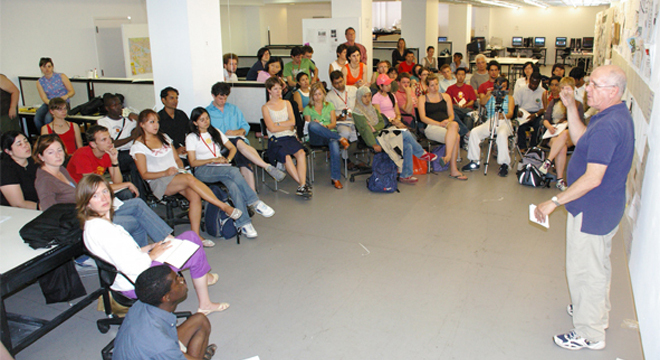 The projects, developed in collaboration with the different groups, were presented back to these diverse communities through a series of events as well as a report which documented the process, results, and how the projects might be taken further. 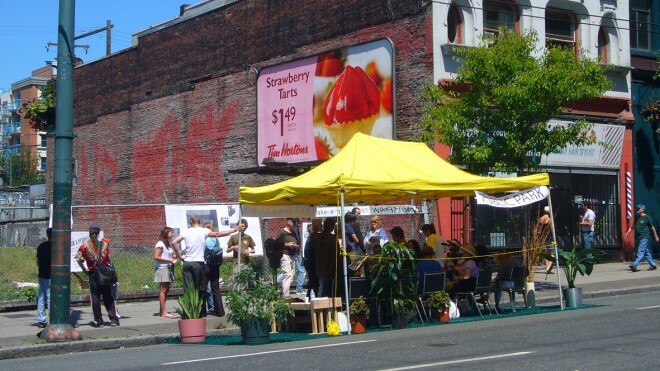 The events were colourful: for example, students working with the Strathcona Revitalisation Committee played a stop animation movie on the side of a building at night and set up a foodstand to encourage passers by to talk. 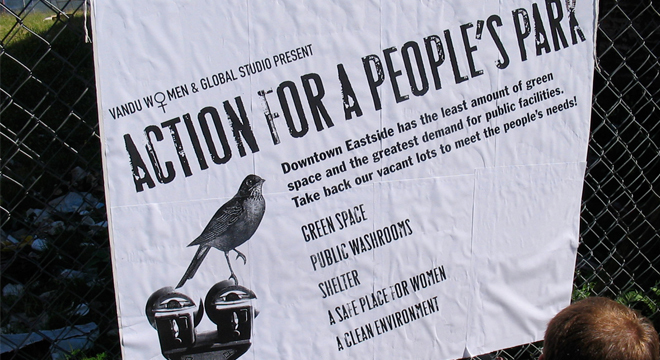 The Vandu group set up a marquee on Hastings St, with chairs, tables and pot plants, and hung proposals for a pocket park on the fence of the vacant lot proposed for the park. Signatures were collected and the 700 person petition in favour of the park forwarded to City Council. PPSR — people , places , situation, response — began as a project in Sydney, travelled around Australia, and then was re-invented in Vancouver with additional local images and filmed interviews about the adverse effects of climate change, natural disasters and poverty. These provided the content for the exhibition pasted onto walls throughout the downtown eastside, and in a “ What are you doing to make the world a better place?” asked one. GS 2006 is documented in the Sydney Customs House exhibition. Speech: Can Cities Rescue the Millennium Development Goals? 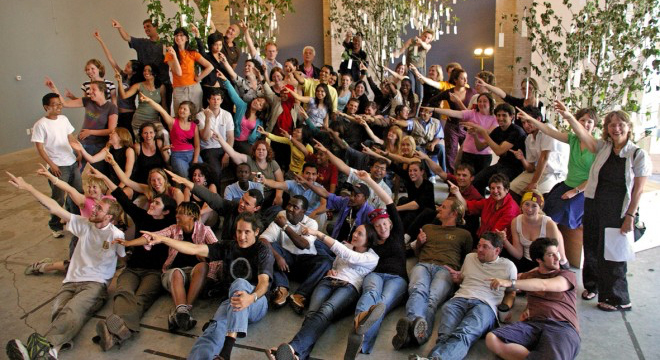 Participatory planning and design Vancouver. The Vandu community and Global Studio take their ideas for a pocket park to the streets resulting in a petition in favour forwarded to City Council.